The Indianapolis Colts were cruising at 12-0 and had tied New England’s recently-established record of 21 consecutive regular season wins as they hosted the Denver Broncos on December 13, 2009. There had been no drop in performance under Jim Caldwell, in his first year as head coach in place of Tony Dungy. The Colts had now won at least 12 games in seven straight seasons and were on their way to reaching the postseason for the eighth time in a row. The key to the offense was still 33-year-old QB Peyton Manning (pictured above), in the 12th year of his outstanding career, and he had a fine stable of receivers in TE Dallas Clark and wide receivers Reggie Wayne, Pierre Garcon, and Austin Collie. The ground game was not as formidable as the passing attack, although RB Joseph Addai was capable as both a runner and receiver out of the backfield. Denver, also under a first-year head coach in fiery Josh McDaniels, had gotten off to a surprising 6-0 start before losing four straight. The Broncos had recovered to win their last two games and were 8-4 heading into the game in Indianapolis. Star WR Brandon Marshall had clashed with Coach McDaniels but was the primary target for capable QB Kyle Orton. There was a crowd of 67,248 at Lucas Oil Field. The Colts had first possession and drove 70 yards in 13 plays, starting with Manning throwing to Pierre Garcon for a 29-yard gain. It was the first of six straight completions and eight in all that ended up with a five-yard scoring pass to Austin Collie. Following a three-and-out series by the Broncos, Indianapolis drove to another score. This time it took seven plays to go 56 yards, highlighted by a Manning throw to Joseph Addai that picked up 25 yards. 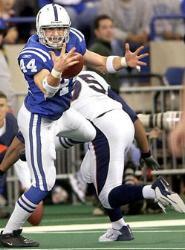 Dallas Clark (pictured below) caught a 10-yard pass for a TD and, with another successful extra point, it was 14-0 in favor of the Colts. In the second quarter, Indianapolis put together another long scoring drive. Along the way, the Colts converted a fourth-and-four situation with a Manning pass to Clark for 22 yards and the 11-play, 71-yard series ended with Manning’s third touchdown pass, again to Clark from a yard out. Down by 21-0 and being dominated by the Colts, the Broncos finally put together a scoring drive of their own. Five of Kyle Orton’s pass completions were to Brandon Marshall, including two that converted third downs and the last one for a five-yard TD. The tally remained at 21-7 at the half. The teams traded punts to start the third quarter until Manning was intercepted for the second time by FS Brian Dawkins, who had picked off a pass late in the second quarter. The turnover gave Denver good field position at the Indianapolis 37, but after advancing to the 20 Orton was intercepted by DB Tim Jennings to end the threat. After a short series by the Colts that ended with a punt, the Broncos again drove into Indianapolis territory but Matt Prater’s 42-yard field goal attempt was wide to the left. On the next play, Manning, who had tossed the three early scoring passes, was picked off for the third time. On this occasion it was safety Darcel McBath giving the Broncos the ball at the Indianapolis 24, and as the period ended Denver was at the ten. The drive stalled there and on the second play of the fourth quarter Prater kicked a 28-yard field goal to cut the Indianapolis margin to 21-10. Once more the Colts were unable to move on offense, with Manning tossing three incomplete passes. The ensuing punt gave the Broncos the ball at their 32 and they moved methodically down the field. Except for a throw to WR Jabar Gaffney for a 20-yard gain, all of Orton’s pass completions were to Marshall, again including a TD pass from five yards out. Denver attempted a two-point conversion to try and make it a three-point game, but RB Knowshon Moreno couldn’t reach the end zone and the tally stayed at 21-16. With the momentum against them, the Colts finally came back alive on offense. 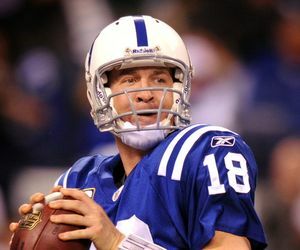 Manning completed a pass to Collie for 23 yards in a third-and-20 situation and, two plays later, connected with Reggie Wayne for 20 yards on a second-and-11 play. The 80-yard drive took 14 plays, used up over seven minutes, and ended with Manning throwing to Clark for a one-yard touchdown that put the game away. The Broncos ran out of downs on their last, desperate possession, with a seven-yard completion to Marshall giving him a record 21 for the day. The Colts won by a final score of 28-16. The Broncos had the edge in total yards (357 to 312) and time of possession (31:27 to 28:33) although Indianapolis had more first downs (21 to 20). The Colts hurt themselves with three turnovers, to one suffered by the Broncos. Peyton Manning’s statistics reflected his up-and-down performance as he completed 20 of 42 passes for 220 yards with four touchdowns but also three interceptions – the most he had thrown in a game in over two years. Joseph Addai rushed for 67 yards on 16 carries and led the team in pass receiving with 5 catches for 49 yards, although Dallas Clark was the more effective receiver with his 5 catches for 43 yards that included three TDs. 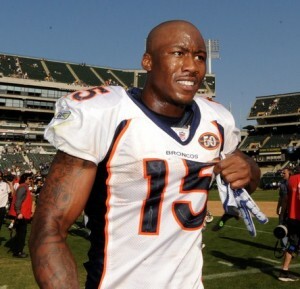 For the Broncos, Brandon Marshall (pictured below) was the big story with his 21 pass receptions for 200 yards and two touchdowns. Kyle Orton was successful on 29 of 41 throws – only eight of which went to a receiver other than Marshall – for 277 yards and two TDs with one interception. Knowshon Moreno gained 63 yards on 23 rushing attempts. The 22nd straight regular season win set a new NFL record and was extended to 23 before the Colts finally lost a game. They ended up topping the AFC South at 14-2 and advancing to the Super Bowl where they lost to the Saints. Denver lost its remaining games to finish second in the AFC West with a disappointing 8-8 record and out of the playoffs. Peyton Manning received MVP honors from the Associated Press and Pro Football Writers while also gaining selection to the Pro Bowl for the tenth time in his illustrious career. He ranked second in the NFL in pass attempts (571), completions (393), completion percentage (68.8), yards (4500), and TD passes (33, tied with Minnesota’s Brett Favre). Brandon Marshall, who broke the record of 20 catches in a game by Terrell Owens of the 49ers in 2000, tied for third in the league with 101 catches (along with Houston’s Andre Johnson), which was one more reception than Dallas Clark and Reggie Wayne, who each caught 100. He gained 1120 yards and caught 10 touchdown passes and was named to his second straight Pro Bowl – but was dealt to Miami in the offseason.